I was fortunate enough to try Chef Andrea Berton’s fabulous dishes many times in the past, but this was my first time tasting his delicious cocktails. As a special drink list, he created 3 cocktails for all the hotels in the MGallery group and 10 exclusive, one for each of them. Talking about the cocktails there was Lorenzo Andreoni, the director of Dry Milano, who taught an amazing masterclass on the rooftop terrace of the hotel ‘La Gare’ in Milan for myself and friends like Lidia Forlivesi of Nonsolofood and Stefano and Riccardo of Gnambox. 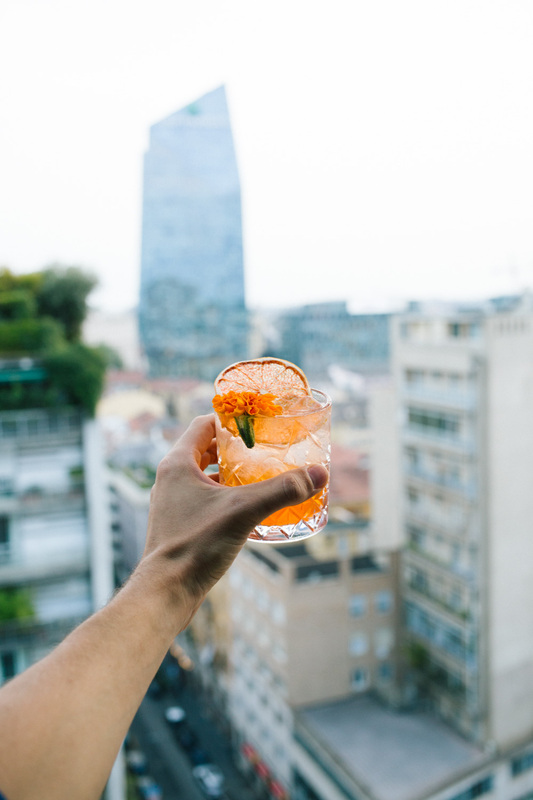 We were welcomed with the amazing preparation of of the ‘Views On Milan’ a cocktail that I have written the recipe for below for you to try at home. The cocktail was so delicious and refreshing after a long summer afternoon that I spent in Milan. For Naples you can try the Mediterranean Scent, a new Bloody Mary inspired by the fragrances of the Mediterranean lands. For Florence he dedicated the Mint Sweet, a new version of the well known Mojito – he infused Earl Grey tea with rum for an amazing result – and for Rome the Vinci’s Secret, a Boulevardier made with a Bourbon Rye Whiskey infused with Lapsang tea. It was so interesting to discover how he made the bitter crystal that he put on the ice sphere: by drying a bitter with whiskey and crumbling it on top. As a Negroni fan, it was my favorite. For Polignano, instead, he decided to mix gin infused with lemon, orange liquor, lemon juice and pomegranate juice and smoke a bell glass for a stunning effect and to also smell an amazing smoked fragrance inside the cocktail. He named it Pomegranate Mood.